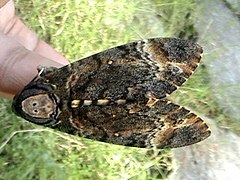 The name Death's-head hawkmoth is used for three types of moth. 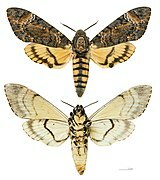 The (A. atropos, A. styx and A. lachesis), and are in the genus Acherontia. The most common usage of the name is for the Europen species. A. atropos is usually found in Europe, but A. styx and A. lachesis are found in Asia. You can spot them by the skull-shaped pattern of markings on the thorax. All three species are about the same in size, coloration, and life cycle. These moths have many unusual features. All three species can make a loud squeak if irritated. The sound is made by moving air from the pharynx, often along with the flashing of the brightly-colored abdomen in a further attempt to deter predators. All three species are commonly seen raiding beehives of different species of honey bee for honey, but A. atropos only attacks colonies of the well-known western honey bee, Apis mellifera. They are able to move about in hives unhurt because they mimic the scent of the bees. Eggs are laid one by one under old leaves of the hostplant, and are green or grey-blue. None of the three species are forced to use a single family of host plant. Many of the types of plants used are in the families Solanaceae, Verbenaceae, Oleaceae, Bignoniaceae, and others. The larvae are strong, reaching 120-130 mm, with a tail horn that stands out or can be seen easily. All three species have three larval color forms: usually green, brown, or yellow. Larvae do not move much, and will click their mandibles or even bite if threatened. When mature, they burrow underground and excavate a small chamber where they pupate. This moth was used in the movie The Silence of the Lambs. It was also referenced in I'm the King of the Castle. ↑ Moritz, RFA, WH Kirchner and RM Crewe. 1991. Chemical camouflage of the death's head hawkmoth (Acherontia atropos L.) in honeybee colonies. Naturwissenschaften 78 (4): 179-182.